In our last article we discussed the various ways to measure your power. Did you know that not only can you use those measures to determine what your Functional Threshold Power is but also that you could use the other data you have been collecting to determine what kind of cyclist you are and how you stack up to your competitors? 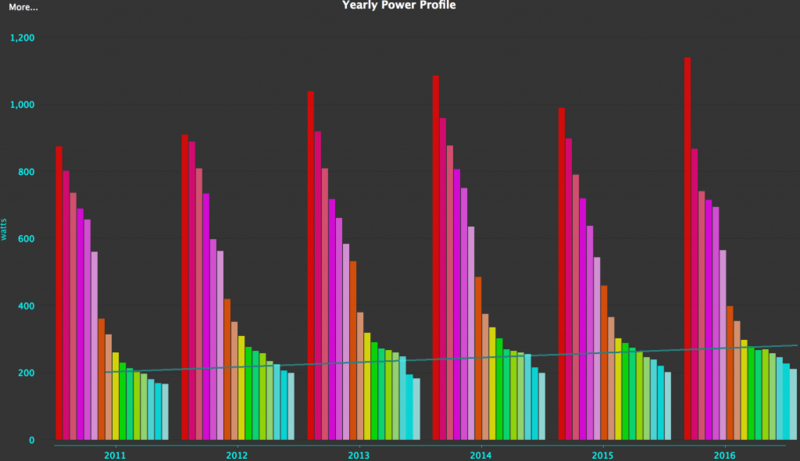 Wouldn’t it be nice to look at the power data you have to determine the kind of cyclist you are? Or better yet what if you could look at the data to determine where you have been focusing your training vs. where you should be focusing your training. 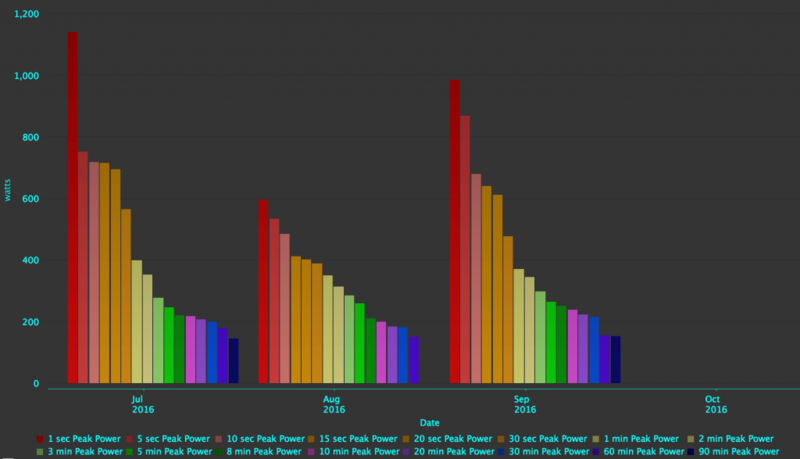 If you have been collecting data for better part of a year and are still having a hard time making sense of it all this is the article that will help further your understanding of how your power data can direct your training efforts and their timing. The graphic above should further help you understand how power can be applied to your specific training needs. The first row represents a typical power curve starting at the sharp end or the top end of your power abilities from 1 second to 1 minute. Then we have what I refer to as staying power that can last from 2 minutes to 20 minutes. Then finally we have what I refer to as your bottom end power that covers 30 minutes to 2 hours. Top End Power is what athletes focus on in explosive scenarios found in road sprinting, BMX, Mass Start Track Events, Cyclocross and even Short Track Mountain Bike. Top end power may also be referred to as anaerobic power, sub maximal power or even Neuro Muscular Power. Top end power development is meant to support sprinting, jumping, attacking, surges or even breakaway attempts. Top end power is something that cyclists of all disciplines would start working on in the latter portion of their build phases during a periodized training program. Developing top end power requires as strong foundation of base training in an effort to build peak power. Implementing Training Factors such as Force, Muscle Endurance, Power Endurance, Speed and Explosive Power are all required to build Top End Power. Staying Power is what athletes focus on when strong efforts are required repeatedly such as chasing down breaks, bridging up and races where there are many climbs. Staying power may also be referred as Threshold power, Functional Threshold Power or power at Vo2 max. Think of staying power as what is necessary to hold a brutal pace in the peloton between attacks, or what a track pursuit and prologue time trial specialists need to be competitive. Short duration mass start events such as criteriums, Cyclocross, 4 cross and short track mountain bike will also need to develop staying power to become competitive as well. Like top end power, staying power requires a strong foundation of base training in an effort to develop your best staying power. Similarly to Top end power staying power is often developed during the latter portion of a cyclists build phases in a periodized training program. However contributing Training Factors such as Force, Muscle Endurance, and Speed that help to build staying power are also worked on during the base period of training. Bottom End Power is what most cyclists in most cycling disciplines strive for with the exception of explosive disciplines such as gravity racing, BMX and track sprinters. Bottom End Power may also be referred as Threshold power, Functional Threshold Power, Aerobic Power or Endurance Power. 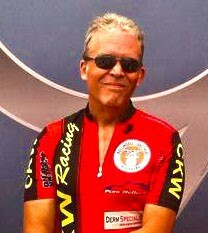 Bottom end power is what builds our ability as cyclist to train more, ride longer and ride faster over longer courses. We often call those cyclists possessing strong Bottom End Power as being diesel engines. Unlike Top end power and staying power, Bottom End Power will require considerable work in the off-season in the base training period to see gains during the race season. Training Factors such as Force, Muscle Endurance, Endurance, Speed and Power are all required to build Bottom End Power. NOTE: If you are not familiar with Training Factors and how you maybe able to employ them in your training please check out this article series. If you are not familiar Periodized Training please check out this article series. Still not familiar with training Zones, then check out this article series to learn more about training zones. Now that we have learned in broad strokes what sort of power is necessary over a curve and how it may apply to various cycling disciplines we need to understand as coaches and athletes how to determine where we are spending our time training, and where we may need to spend more of our time. This chart simply represents the progress of an athlete’s Critical Power Curve (CP) performances starting at 1 second and ending at 90 minutes. This chart was created using Golden Cheetah’s basic metric chart with no preset, and the addition of the Metric Curves of Peak Power from 1second to 90 minutes. You can add one to multiple trend lines to represent a CP Metric such as we have done for this athlete at 20min CP. The trend line is showing steady progress upwards since this athlete began to train with power. This chart is just like the previous chart but only covers a monthly view over a year or quarter as to how an athlete’s CP performances starting at 1 second and ending at 90 minutes are progressing. I also like to look at the data in the raw. Creating a summary chart in Golden Cheetah does this. Knowing what type of cyclist you want to be means understanding the power and duration you must be able to train at to become truly great with in your discipline. Knowing how you have been focusing your time in training is very helpful in accomplishing this. I created a Distribution Chart in Golden Cheetah that uses a “Current Selection” under dates, Plots Data Samples as “Power”, Shows “Percentage Time” as “Show In Zones”. 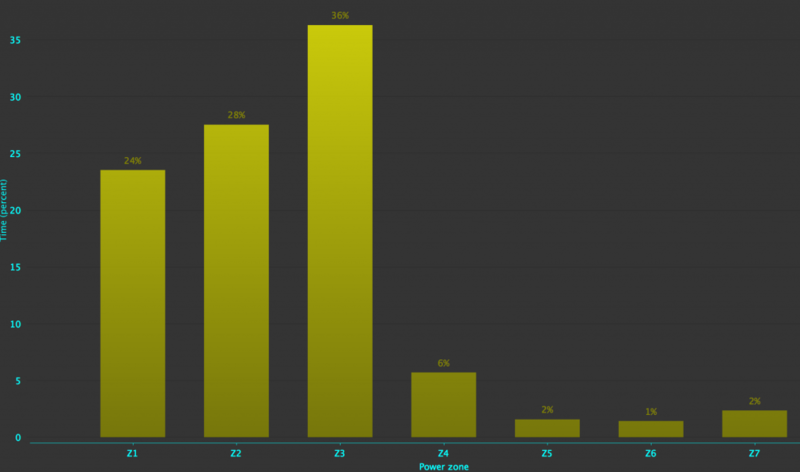 This chart shows what percentage of time this athlete has been spending their time in which training zones. While I have found that the models used with the Xert Software do a better job at determining the focus of an athlete’s training this chart in Golden Cheetah is very helpful. Now that you have information on the duration and power you need in you’re given discipline you need to know how you compare to your competition. In the past many coaches would use Allen and Coggan’s Power Profile table but it has proven consistently to me not to be an effective guide. The power profile table was based on years of data collection of athletes at various levels of training and categorization. This table was then used to look at an athlete’s ability. So for instance it may say that a Category 3 racer should produce X watts for 20 minutes to be competitive in their races. This is a broad explanation by me but the table is built of averages from athletes all over the world. You may find that the table does not apply to you. You may have less or more power and still not be competitive. Well then, how do you get a more appropriate view of how you stack up? Several of my athletes are probably slack jawed at this point. Many know that I am not a fan of Strava analytics and I do not trust their calculations but one thing has proven true. When a cyclist who is using a power meter and rides across a segment their power data for that segment will be captured and displayed for all to see! Step 1: Find segments in your area, hometown, city, or region that are of the same duration as the CP durations you are focusing you’re training on. NOTE: You can use the segment explore feature by looking at roads near you or you can search for racecourse segments. Step 2: Find your competitors most recent efforts on these segments. Note: Past history can be useful but really what matters is the current year’s information. If your competitor hasn’t ridden a particular course or segment in a while you have no choice but to either use older data or look for other competitors. Step 3: Know your weight and determine your competitor’s weight. Note: You will need to pay a premium subscription to see other Strava member’s weight. Step 4: Use this power to weight calculator to determine yours and even your competitions power to weight ratios. NOTE: My calculator doesn’t save state or compare two or more sets of athlete data so you will need to copy and paste results into a spreadsheet. The above steps are by no means perfect. They are but a starting point and are of course subject to all sorts of human and technical errors. For instance some Strava athletes may not keep their weight updated on Strava. Your competitor may have a lighter bike or wheels than you. The conditions that were present on a segment when data was captured may or may not have been optimal when you or a competitor was riding. The wattage data per segment MUST have the small lightning bolt next to it. If it does not it means the power was calculated by Strava and is almost useless for your purposes. You can determine where your power based training should be focused, when you should be focusing on this sort of training, learning how you are progressing with your training and even how you may stack up against your competitors! If you have questions about this article or past articles feel free to email Coach Rob.